Skin discoloration is a common condition that occurs mostly from sun exposure, and leads the skin to become darkened in certain areas or patches. These areas, usually brown, are a collection of pigment called melanin. Melanin is produced by the skin, and absorbs ultraviolet rays to protect the body from the sun. Increased melanin leads to increased discoloration. Anyone can be affected by skin discoloration, but generally lighter-skinned individuals are at greater risk for discoloration and cancer. 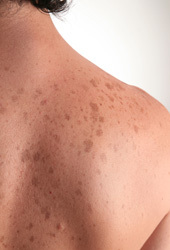 Freckles, medically known as are small brown spots found on the skin, most commonly on the arms and face. Freckles are extremely common, especially among light-skinned people, and those with red or light hair. Freckles are caused by genetics and sun exposure, and tend to darken in the summer or when exposed more often to the sun. People with a lot of freckles should avoid the sun and always wear sunscreen, as they are more susceptible to skin cancer. Because freckles are harmless, they do not need to be treated. However, if you are unhappy with the appearance of your freckles, there are several steps you can take to prevent further development, and to fade existing freckles. Talk to Dr. Jay about available treatment plans for freckle-fading, and remember to always wear sunscreen. Protecting yourself in the sun will prevent freckles from darkening, and new freckles from developing. Melasma is a dark skin discoloration that occurs on sun-exposed areas of the face. It is generally characterized by a brown color over the cheeks, forehead, nose and/or upper lip. It is often symmetrical, matching on both sides of the face. Melasma is sometimes referred to as “pregnancy mask,” because it has been linked to the female hormones estrogen and progesterone. Therefore, pregnant women, or those taking some forms of birth control pills are most likely to develop melasma. For these women, melasma generally disappears after delivery, or when pill taking is terminated. If melasma does not go away n its own, it can be treated with chemical peels, and some creams or topical steroids. These measures are not generally necessary, and wearing sunscreen and protecting the face during sun-exposure can help prevent melasma.